Loknaad means people’s voice in most Indian languages. Some call it a progressive music band; for some others it is a cultural space trying to revive the waning sensitivity and dignity. Simple lyrics, stirring compositions and minimal instrumentation lend an earthy feel to Loknaad's music. Considered to be one of its kind, Loknaad is a tri-lingual Indian team of two dreamers, Charul & Vinay, who create and sing songs of hope, songs of life. 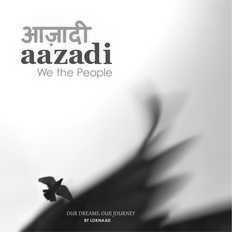 Loknaad songs have inspired many people to look around, to reflect and continue to dream and struggle for a just world. Charul Bharwada & Vinay Mahajan, founders of Loknaad are professionals by qualification; researchers and musicians by choice and passion. Moved and inspired by people's efforts for a better world, they create moving music as Loknaad.